This game is played just like Hangman only it is a much gentler version. Students draw an arm, a leg, etc. until a complete person is made...at that point the loser is determined! This is best played with partners. This activity will aid in letter formation, vocabulary, comprehension, and letter formation. 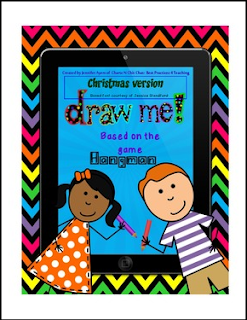 Great for work work activities, vocabulary centers, reading centers, holiday centers, and purposeful practice.